Chef Carved Entree Roast Turkey with Cranberry Gravy…..………………………….….$28.50 Roast Sirloin of Beef Au Jus……………………………………………….….$33.95 Roast Prime Rib of Beef Au Jus…………………………….……………..$36.95 Roast Tenderloin of Beef……………………………………………………….$43.95 Salads (Choice of Two) Tossed Green Salad Caesar Salad Mescluen Green Salad Caprese Salad Sunburst Fruit Salad Additional Entree (Choice of One) Chicken Francaise Chicken Parmigiana Chicken Marsala Atlantic Baked Scrod Stuffed Fillet of Sole Accompaniments (Choice of Two) Penne Marinara Cavati Bolognese Rigatoni Pink Vodka Broccoli Aglio Olio Green Beans with Herbs & Tomato Vegetable Medley Wild Rice Pilaf Oven Roasted Potatoes Roasted Sweet Potatoes Dessert (Choice of One) Double Chocolate Cake Strawberry Shortcake New York Cheesecake Carrot Cake Vanilla Ice Cream Chocolate or Raspberry Mousse All Children ages 3 - 10 years are half price for buffets. Children under the age of 3 are free. All prices subject to 20% service charge and RI State sales tax. Please contact us for our complete terms & conditions. ll Children ages 4 - 10 years are half price for buffets. Children under the age of 4 are free. Please contact us for our complete terms & conditions. Valley Country Club Food & Beverage minimums vary by the season, day of the week, the room and additional factors. Please contact us for the required Food & Beverage minimum for your event. Atmosphere/Decor: A grand space featuring a large horseshoe bar conveniently located in the center of the room. 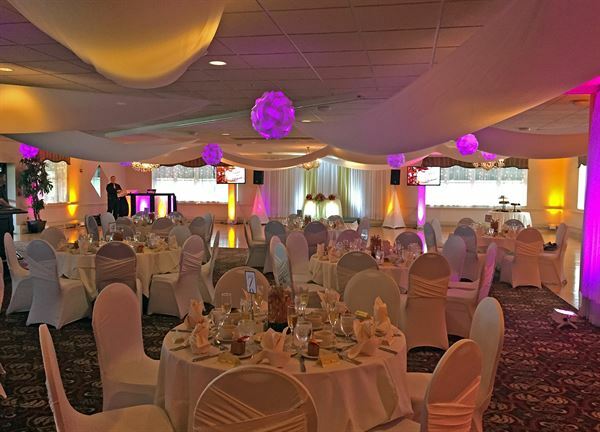 Our dance floor is one of the largest in Rhode Island and can accommodate all of your guests. A beautiful room including Victorian stone and fireplaces.